The fantasyland theatre is a huge tented area in the rear of the park. I had an idea that it would be cool to have this structure made of real fabric. 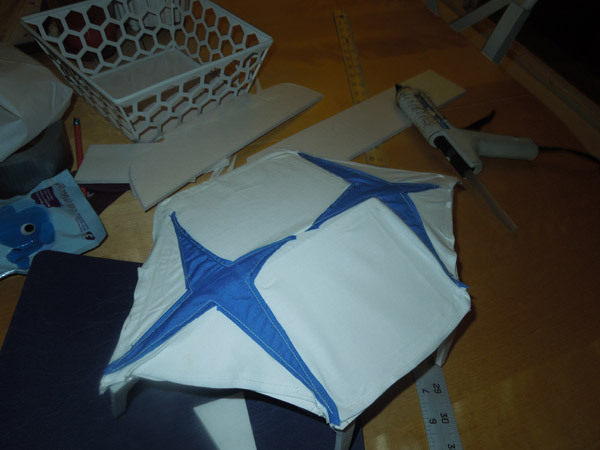 I used some blue fabric remnants and some simple white cloth to create the twin peaks circus tent appearance. 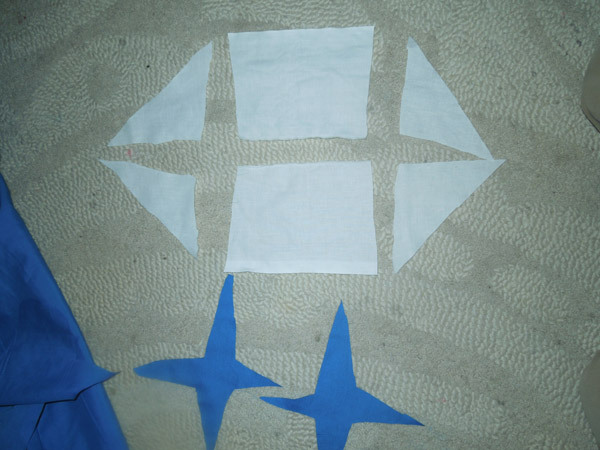 I sewed the pieces together from the underside so that the seams wouldn't show. If I didn't have a sewing machine, I'm sure hot glue would have worked just fine. 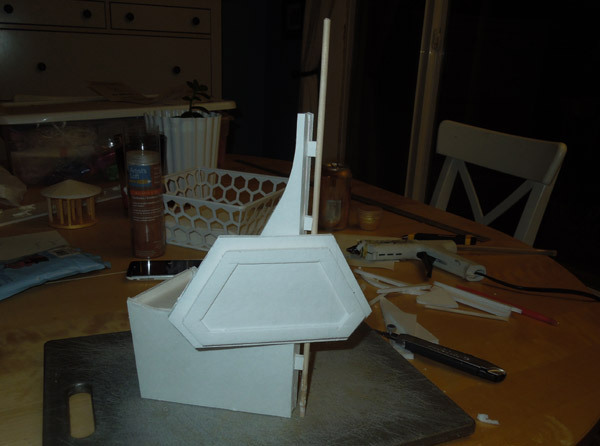 After I had the fabric stitched together, I glued it to a hastily-constructed foam building in roughly the correct theatre shape. 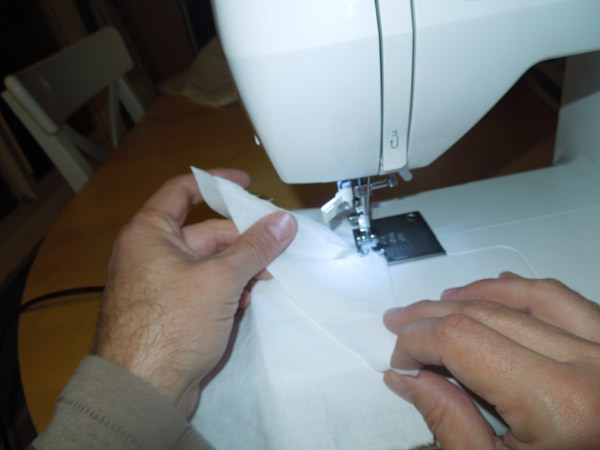 Tragically the fabric tent became folded and wrinkled, distorting the ideal tent shape. The center "hub" park of Disneyland is important, but there isn't much there. Grass, bushes and a statue of Walt and Mickey. 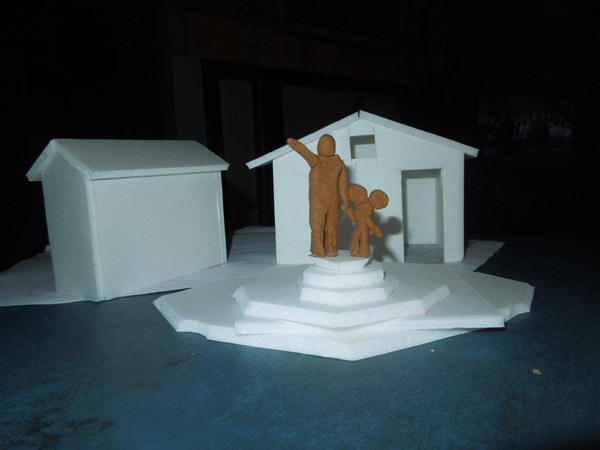 The statue is definitely the defining feature of this area, so I crafted an oversized version, nearly two inches tall. From "The Disney Enthusiast" website: "The Partners statue stands at the center of Disneyland. Walt holds Mickey's hand as he grandly gestures over the world he has created"
Brown air-dry clay was the best option I had to recreate this bronze monument. I don't think anyone will notice the difference. This costume project has obviously created a need for me to closely examine the variety of rides within Disneyland. I've made a couple of interesting discoveries. For example I've learned that the submarines in the Submarine ride travel below the Autopia roadway. Another is that there are three rides which go around in a circle in Fantasyland: The Teacups, Dumbo and the carousel, and they are all three within spitting distance of each other. 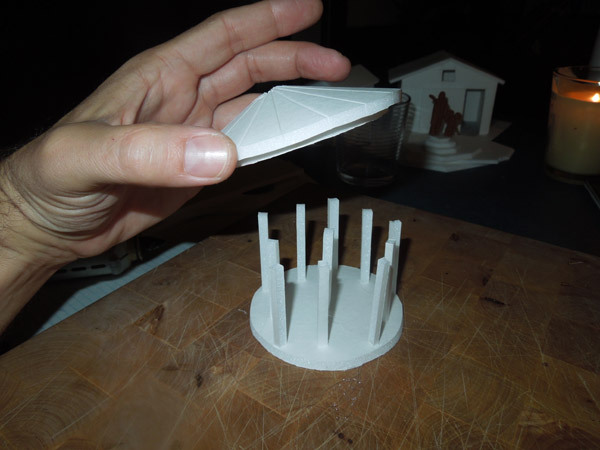 The Carousel is simple enough to recreate in foamboard. I cut two circles, support beams and a multi-segmented cone for the top. 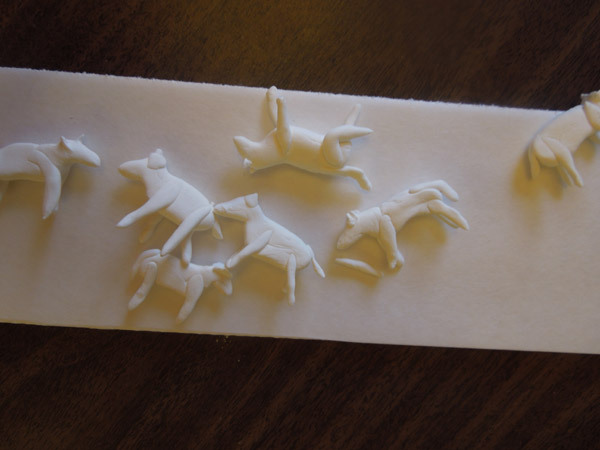 I sculpted a team of horses from white air-dry clay. This stuff isn't the correct material for fine details, but I gave it a shot. Some of them ended up looking more like cows and dogs, but the overall impression was positive. Much like the Pirates of the Caribbean, Star Tours doesn't have much of an iconic building or entrance. The shape of the "Star Wars" title is the strongest design cue. For this attraction, I created the tall lightning rod of the entrance with a triangular base and mounted the signpost onto the front of it.